Students of the Faculty of Medicine at Unimus participates in an International Student Mobility. Semarang │(August 19, 2017) Students of the Faculty of Medicine at Universitas Muhammadiyah Semarang (Unimus) will be involved in an International Student Mobility at Cyberjaya University College Medical Science (CUCMS), Malaysia. An official discharge ceremony was held prior to their departure. The ceremony was led by Prof. Dr. Masrukhi., M.Pd, as the Rector of Unimus, accompanied by the Dean of the Facultty of Medicine Unimus (Prof. Dr. dr. Rifki Muslim SpB. SpU(K), the Vice Dean I (dr. M Riza Setiawan, M.Kes), the Vice Dean II (dr. Aisyah Lahdji, MM, MMR) and the Executive Director of Unimus’ International Relationship Officer (IRO) (M. Yusuf., Ph.D.) in the midst of the ISOCMED held by the Faculty of Medicine Unimus at Patra Jasa Hotel, Semarang today. The International Student Mobility at Cyberjaya University will be held on August 20-25, 2017. The participants from Unimus are 21 sixth-semester students dealing with Occupational Health course that they take in the 18th block. The rector in his speech advised the students to keep the good name of the alma mater and the nation in general during their participation in Malaysia. He also expected them to optimally learn to get knowledge that would meet with their competencies in the medical sector. He finally hoped that the students have equipped themselves with knowledge that they have learned at Unimus before arriving at Cyberjaya University as well as would attend each activity properly and return to Indonesia with new knowledge in hand so that there would be something to share with after the return. “Since the enactment of the Asean Economic Community (AEC), medical doctors are free to work in any of the 11 countries in ASEAN, including Indonesia. I hope that this event will be able to give the students new experiences and knowledge in order to extend their networks. Building an international network is very important for a student, as either an individual or a student of Unimus. It is especially for those willing to take a master’s program through a fast track program provided by Unimus in collaboration with the CUCMS ” he explained. Dean of the Faculty of Medicine at Unimus handed-over a letter of assignment to the representative of the students. In line with that, Dean of the Faculty of Medicine at Unimus stated that the event at Cyberjaya University Malaysia will be a good opportunity to the students for studying, so that they had to take the rare occasion. “You can see by yourselves the technology and knowledge in the medical sector. Thus, if you want to take some further study or have some other will, you know where to go” added Prof. Rifki. Meanwhile, the Vice Dean I, in his speech, said that the event would become a part off the effective learning program in the 18th block, as a requirement to accomplish the Occupational Health course as well as support the one of the missions of the Faculty of Medicine in terms of internationalisation. 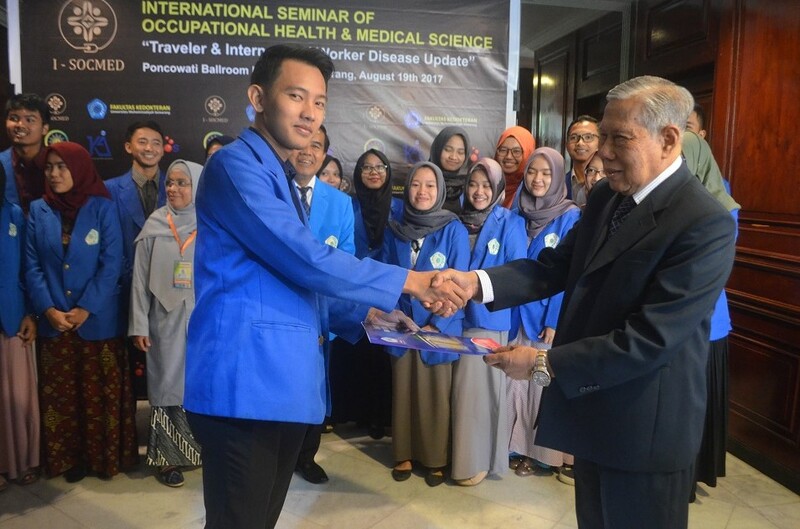 “The participants will take part in all scientific activities such as presentation, lectures, field activities, and visit to some local industrial site related to occupational health, which is one of Unimus’ leading sectors” he explained. Lastly, the Executive Director of the International Relationship Officer at Unimus added that it was second year of the international student mobility program at Cyberjaya University for Unimus’ students. Reported by the Technical Unit of Public Relations and Protocol. Unimus establishes New Cooperation with Domestic and Foreign Agencies for Quality Improvement.